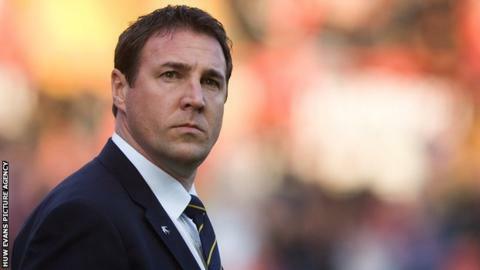 Cardiff City boss Malky Mackay believes the row in football over whether to wear 'Kick It Out' T-shirts has damaged the sport's anti-racism efforts. Leading players including Manchester United defender Rio Ferdinand chose not to wear the garments over a perceived lack of action from the campaign. "I just think it falls into the hands of the racists," Mackay said. "They'll be delighted there is in-fighting as has been seen in the last few days." The Cardiff squad opted to wear the Kick It Out T-shirts before their defeat at Nottingham Forest at the weekend. But several high-profile black players at Premier League clubs refused to, including both sets of players at the game between Swansea City and Wigan Athletic. Swansea goalkeeper Michel Vorm told BBC Sport Wales that their stance reflected their desire for greater action to be taken. Who chose not to wear Kick It Out T-shirt? "Everybody is against racism of course but everyone expects the governing bodies to do more," said Dutchman Vorm. "They really have to do something and not just say something on a T-shirt. So some of the players didn't want to wear the T-shirt because of that." Mackay said that showing overt support for campaigns was a matter of individual conscience for his players, but that he hoped football could show its solidarity over such issues. "It's a free society here and as far as things like that are concerned everyone has got their own judgement to make on what they want to do," Mackay added. "I wouldn't force anyone to wear it but my personal opinion is that we should wear it. "The chairman [Lord Herman Ouseley] of the 'Kick It Out' campaign has been championing kicking racism out of our sport for years and is trying his damnedest to make this work, as have a lot of people. "People have got opinions but to stand as one block and try and fight against it is the best way." Mackay compared the concerns over racism in British football with the problems sectarian problems that had beset Scottish football, especially in regard to the two Glasgow clubs of Rangers and Celtic. "It's a problem in society, it's down to individuals. When you're talking about 25,000 people in a crowd, that could be 25,000 people turning up at any event - a rally - so you're always going to have a minority," Mackay said. "It is a minority but you're always going to have that I think. What it is now is it is massively highlighted if something does happen at games. "In Scotland the problem was bigotry more than racism and that over the last couple of years has been highlighted enough, that now certain singing at grounds is unnacceptable. "It was always unnacceptable but it's now not allowed at both Ibrox and Parkhead and that can only be a good thing."